Do you love banana bread? Me too! You may have noticed I post a lot of dessert recipes with bananas. No I do not work for Chiquita Banana behind the scenes. :D It's the nutritionista blood in me -- such a great way to sweeten a dessert naturally rather than white sugar. You may have also noticed if you follow my food photos on instagram, I bake quite often and eat my baked goods for breakfast like I did today with some sunflower butter. This recipe was completely unplanned but it turned out moist, sweet and deeeelicious! I happened to be cleaning out my freezer and came across a bag of quinoa flour that I bought a couple of months ago and a bunch of frozen bananas. I thought to myself, what a great idea! Why not try my classic b-bread recipe with quinoa flour. Please note: Quinoa flour is quite a strong tasting flour. If this is your time making a gluten-free b-bread, I suggest you start with my brown rice flour recipe. Quinoa flour is indeed a wonderful choice because it is a complete protein and it is gluten-free. Method: Combine banana, sugar, eggs, coco oil, almond milk in a bowl. In a separate bowl, combine dry ingredients. Mix both batches of ingredients together and stir well. If you find the batter is still too dry, add a touch more almond milk. Grease a medium size loaf pan and pour mixture into it. Bake at 350F degrees for 50-55 minutes until a fork inserted comes out clean. Cool for about 10 minutes before you remove it from the pan. It will rise about 2-2.5 inches. Enjoy with some sunflower seed butter! Looks amazing! We have only used quinoa a little bit over here at my house. We usually use almond flour. Your blog keeps shouting quinoa at me. I must try it more! Do you recommend drinking almond milk over soy? I've been drinking unsweetened organic soy, and I'm just curious if I should switch. If so, which brand of almond milk do you recommend? Just made this...yum! What a perfect afternoon snack. Thank you for this useful topic. We will continue to follow. It's too bad this recipe includes eggs. A substitute of that ingredient would be most welcome. You can use chia seeds. 1 egg = 1 tbsp chia seeds + 4 tbsp water. Let sit for 5 minutes and then you can use it! Hi Joy, Can I ask about the use of coconut palm sugar? What are some of the benefits of using it over other forms of sugar? As well, I purchased date sugar to make a raw food recipe last year ... would that be an adequate substitute. Thanks ... can't wait to make this. You should make a cookbook - all your recipes look great. I would totally buy it! i was looking up gluten free recipes and came across your site. im in love with the recipes and all your wonderful nutritious info. 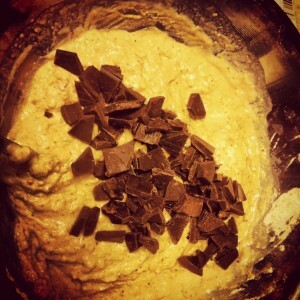 Im subscribing now and I'm about to make a batch of your coconut flour banana pancakes for my breakfast tomorrow, yum! i cannot wait to try out your Quinoa banana chocolate chunk bread. Thanks for all the goodness! Nutrition info if cut into 8 large slices (1" thick): Calories: 392.5 Total fat (healthy fats though): 14.3 g Cholesterol: 52.8mg Sodium: 70.4mg Potassium: 120mg Carbs: 58.5g Dietary fiber:4.7g Sugars:18.7g Protien: 9.9g I loved this recipe but was thinking that substituting a bit of fat free yogurt and/applesauce for some of the coconut oil and palm sugar might lower the calorie count a bit for those of us following our calorie intake (it is January after all :) ). Also, I thought that the carmelized-type crust that formed around the edges from the sugar and almond milk had a fantastic nutty quality to it! I may try dividing the batter into greased muffin tins next time to make more delicious crusty edges! I'll definitely be passing this recipe on to my gluten-free mom. Thanks for sharing! Just made this and it is the best banana bread I have ever eaten, gluten free or regular. I have only recently decided to start cooking gluten free and am realizing how difficult it is to get good recipes. So thank you for posting! I just made this recipe, in the form of muffins, with a little help from my 2 year old daughter. The results are fabulous! We will be following your blog from now on - thanks! Delicious! Can't wait to try this. I love bananas in baked goodies! Two big thumbs down from my husband and I, I'm afraid. Hoped to serve this to a friend with Celiac but our taste test ruled that out. Looked nice but had to throw it out :(. Hi!! Can Quinoa flour be substituted with almond flour? It's a very different texture, much more dense. So it will yield a different banana bread. You could try it but a better sub would be coconut flour.You'd have to play with the ratios of liquid to flour though because coconut flour is incredibly absorbent. I have another gluten-free banana bread I make all the time! 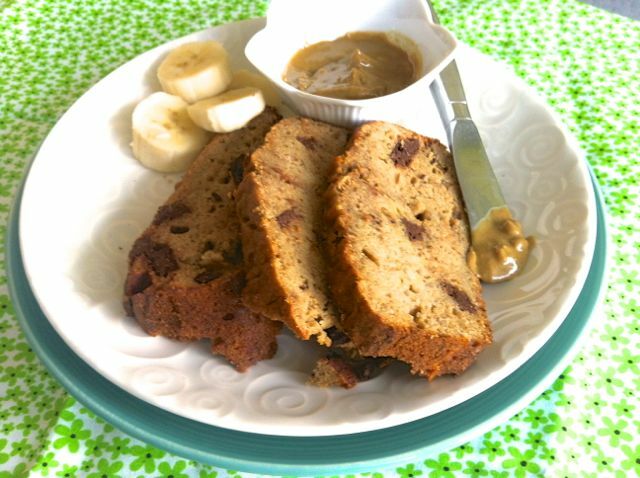 https://www.joyoushealth.com/20000-blog-buckwheat-banana-bread-gluten-free-recipe Good luck!